Organizers Tyler and Monica Slaven of DeGraff along with fellow volunteers are ready to unload the 3,000 toys they collected for last year’s toy drive. DEGRAFF – DeGraff area resident Tyler Slaven, an agri-business student at the University of Northwestern Ohio in Lima, is spearheading a statewide toy drive, along with his sister Monica, to collect toys to give to kids at Nationwide Children’s Hospital of Columbus this Christmas. Slaven, president of the Ohio Virtual Academy Agricultural Society, said this is the fourth year for the toy drive that he and Monica started as teens in high school. “The toy drive has taken off tremendously, and we were able to provide a toy for 3,000 children last year,” said Slaven. “Every year we gather up all of the donations collected throughout the state, and our group will meet up at the hospital just before Christmas. This year, I have set a challenging goal to double our collections to 6,000 toys,” added Slaven. 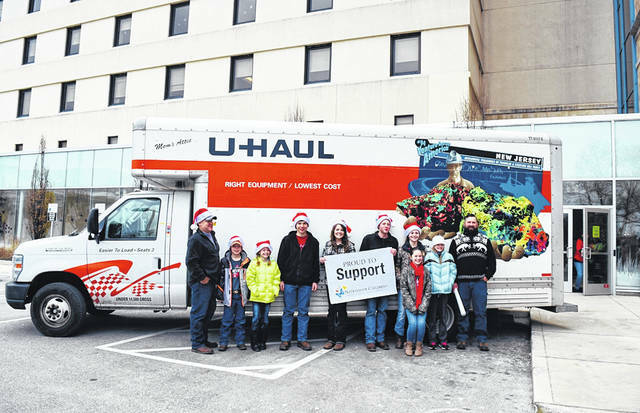 Last year’s efforts by the Slaven siblings and their crew of volunteers at the OVA Agricultural Society was so successful it required a large U-Haul truck to transport all 3,000 toys to the hospital. “We collected so many toys last year that we ran into an issue of how to get them to the hospital in Columbus until a local business man, JR Lane, owner of the Lane Lube Express in Bellefontaine, donated the use of one of his trucks for us. “He and his wife, Nina, actually met me Sunday morning at my house to personally help load the toys and drive them to the hospital,” Slaven added. Lane Lube Express will again this year be donating the use of a U-Haul to transport the toys up to the hospital. “Again, they will assist in also personally driving to the hospital with us on Dec. 16,” said Slaven. “It truly takes a group effort to be able to reach all of these kids. It is really unfortunate that these children have to be in the hospital, let alone during Christmas time. The least we can do is try to brighten their day and put a smile on their face by providing them a toy on Christmas morning,” added Slaven. This year Slaven will coordinate the Auglaize, Champaign, Logan and Shelby county communities, as well as assisting the many other communities across the state, in helping with donations. Toys will be collected until 4 p.m. on Saturday, Dec. 15. All toys will be delivered and donated to Nationwide Children’s Hospital of Columbus on Dec. 16 for children who will not be able to be at home with their families for Christmas. This year Slaven is adding events to help reach the ambitious goal of 6,000 toys. On Saturday, Nov. 10, Slaven and his group will put on a Bake Sale at the Tractor Supply Store in Bellefontaine from 10 a.m. to 4 p.m. The Slavens will offer cookies, brownies, cupcakes, pumpkin spice bars and more. All proceeds will go to purchasing more toys for the toy drive. Slaven is organizing a couple of Santa Day events to boost donations. If you’re not sure what type of toy you would like to donate to the toy drive, below is a list of popular toys that kids wish for at the hospital. “We are accepting all non-violent new and unwrapped gifts for all ages of children up to teens,” said Slaven. Rattles, Teethers, Stacking Cups,Shapes, Plastic Links, Cribs, musical or light up toys. Crayons, Coloring books, Playdoh, Puzzles, Books, Board games, and Dolls. Bellefontaine – Lane Lube Express, 223 N. Main St.; Bellefontaine Tractor Supply, 1651 S. Main St.; Education Station, 136 S. Main St.; Marketplace Bistro, 130 S. Main St., Suite 111; Dorceys Flowers, 125 W. Columbus Ave.; Union Station, 613 Hamilton St.; Big Lots, 1760 S. Main St.
West Liberty – Dorceys Flowers, 108 N. Detroit St.
DeGraff – Steve’s Market DeGraff, 300 Cretcher Ave.; Gangster’s Ristorante, 124 S. Main St.
Urbana – Steve’s Market, 324 N. Main St.
North Lewisburg – Steve’s Market North Lewisburg, 184 W. Maple St.
Mechanicsburg – Mechanicsburg Public Library, 60 S. Main St.
Botkins – Koenig Botkins, 306 N. Main St.
Sidney – Sidney Tractor Supply Co., 1650 Michigan St.; all Shelby County Public Libraries, 230 E. North St.
Marysville – Marysville Rural King, 1000 N. Main St.